At Shop With Us, we can’t resist a stylish pair of sneakers! From our everyday style to our weekend wardrobe, a stylish pair of shoes can certainly go the distance with our wardrobe. An absolute must-have for every fashionista, we love that sneakers keep our feet stylishly snug without the fear of sore feet with every wear. That’s why we always try to welcome as many options into the fold, so we can take a break from our heel collection when needed. without sacrificing an ounce of fashion. While there are tons of designs to choose from, we love a pair that’s effortlessly versatile and packs a stylish punch! We met our match in these Converse sneakers! A fabulous construction that will surely come in handy with our year-round style, we can’t wait to bring these kicks home with Us. See It: Grab the Converse Chuck Taylor ‘Shoreline’ Sneaker at Nordstrom for $50 while it’s still in stock! The Converse Chuck Taylor ‘Shoreline’ Sneaker blends classic flair with cutting edge style. Designed with a crisp canvas upper, this number offers the ultimate cool-girl vibe that we can wear with just about anything. Made with a crisp white canvas upper, this shoe provides Us with the level of comfort we love. There is a hidden elastic at the tongue for easy slip-on wear. Our favorite detail? The stripe detailing! Topping off this sneaker with red and blue stripes, this chic number adds a nice pop of color while staying true to its minimalist flair. Classic in nature, this construction boasts a lace-up detail that works to keep our feet cozy and snug with every wear. Sporty and every bit as trendsetting as we could imagine, this offering will easily become our new favorite in no time! We are loving the white hue. A great color that will look pretty and polished with just about any look we can dream up, these shoes will certainly get plenty of wear with our wardrobe. From casual Fridays at work to running errands, these sneaks serve up a stylish vibe we just can’t get enough of. With almost 1,000 reviews under its belt, Nordstrom shoppers are totally smitten with this style! Many reviewers love that they are just as classy and comfy as the original Chuck Taylor design, while others love that they run true to size and make a great everyday staple. Shoppers also like that you can slip these on and go about your day, while others like appreciate that they have a nice cushion and run true to size. One reviewer shared that these kicks look cute with shorts, jeans and even a sundress. Many reviewers also adore that these shoes have fewer eyelets for a more feminine look, while others love that they feel amazing should you decide to wear with or without socks. Shoppers also dig that you can wear them traditionally or with the heel folded down, while others like that they don’t make your feet look huge. One shopper noted that these shoes were versatile enough to wear to an all-white party and out to run errands. We already have a ton of ways we can wear these sneakers and we plan on stepping out with a mididress, a moto suede jacket and a shoulder bag for a casual style win! We can even add this pair to our work attire with cropped trousers, a graphic tee, a boyfriend blazer, an embellished brooch and a hobo bag for a relaxed, yet structured ensemble. For days when we’re running errands, we’re pulling out joggers, a long sleeve tee, a fleece-lined jean jacket and a wallet on a chain for a comfy number. We can even take our sporty style to the next level with Adidas track pants, a V-neck tee, an oversized sweater and a backpack to seal the deal. No matter how we decide to style our look for the day, the possibilities are truly endless for a stylish ensemble. With sizes 5 to 11 currently in stock, you can bet that we are adding these sneakers to our cart ASAP! 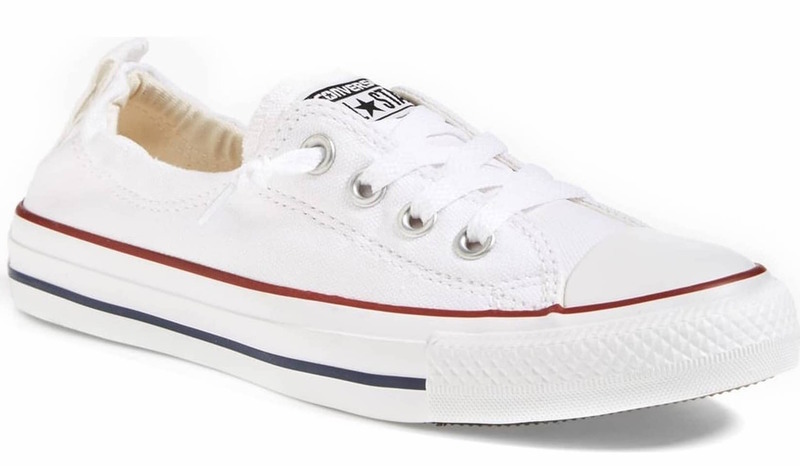 It is not too often that you find a chic pair of Chuck Taylor sneakers for an amazing price, so we plan to take advantage while the sale is still on! It’s time to kick our weekly style into overdrive!